By Angelina Cheung | 02:29 請按廣告以支持本站! Hong Kongese always complain Hong Kong MTR (Mass Transit Railway) only inflating the ticket fees and not improving in quality. The worst is trains are malfunctioning in busy hours, causing inconvenience to the passengers. So, having been in Sydney, Australia for 6 months, I would like to let people know how train in Sydney works. ComfortabilityUndoubtedly NSW train's seats are comfy (Some trains' model are old which is less comfy). Sofa-like seating, double-decked and the seats can be adjusted moving forward and backward. However, passengers are allowed to eat inside the train, sometime I can even see the McDondald's paper wraps and cups. In my opinion, the reason of having a comfy train is because it travels for a long distance, up to 3 hours or more. It will be tired if you need to stand in the train for the whole journey. In Hong Kong, the train's main goal is arrive to the destination as fast as possible, thus the train's design is simpler. It emphasizes on the number of passengers on each traveling. In busy hours almost every train is packed with people (Seating or standing). The frequency of the train is 1-2 minutes apart. Thus the capacity is really huge. 1. No Octopus card? 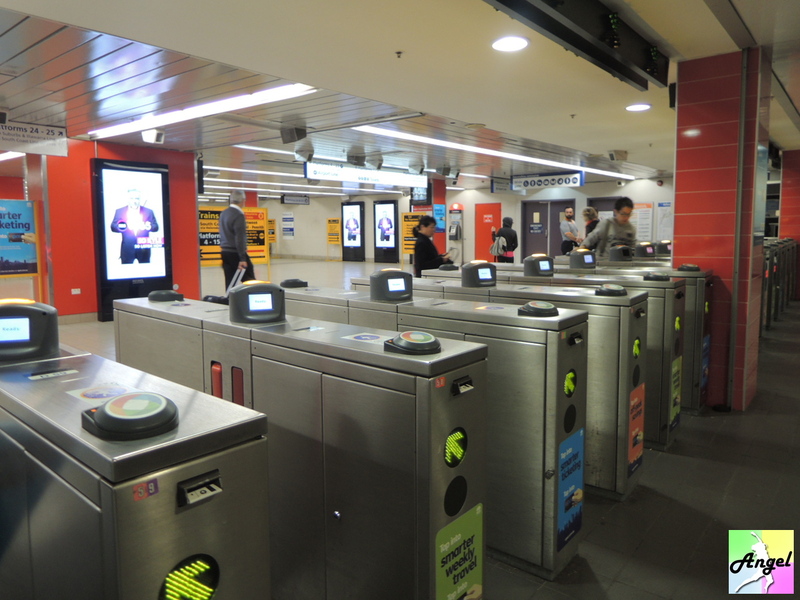 Still using paper ticket?In 2014, Sydney lastly has sort of Octopus Card of Hong Kong. It cannot be named as this as it can only be used for public transportation (Train, ferry, bus). Unlike Octopus card, it cannot be used to buy groceries in supermarket or food in restaurant. So, you can always see people queuing up at ticket machine/counter for paper tickets. In busy hours, it is nonsense to queue up for a ticket. How could it be possible? Still need to queue up in busy hour? Cost2. Expensive fareThe cheapest for adult one way is $3.80, Hong Kong dollar $28 (Hong Kong the cheapest one way train is HKD$4.20), as such Sydney's train ticket is 7 time more expensive than Hong Kong's. Even Sydney's living cost is more expensive than Hong Kong's (Dining outdoor costs AUD$10 in average, HKD$70), the transportation cost is expensive comparatively. If you need to go to some places that are far away, like over 1 hour of travelling, most of them is one hour for one train. If you miss it, you can sleep for a while and wait for the next desperately. I need to wait for another 29 minutes for another one? As there are a lot of stations in NSW, each train's stopping stations are different. They will pass through some stations. Before getting on a train you need to look at the screen to see which platform you shall go for getting the right train and how many minutes left for departing (Central station has 25 platforms). You can also download mobile apps or use mobile to view the schedule for the train. There is advantage for this, you can get to the destination more punctually. 5. What shall I do if I missed the station while I am on the train? Depending on which line and which station you have reached. But if you arrive to a small station, maybe you need to wait for a long time for a train back to the station you want to go. 6. Train arrives punctually, and leaves punctuallyIf you cannot catch the right train in the right time, you may need to wait for 10+ minutes or maybe even 20+ minutes. Please remember to check the schedule beforehand. If you need to buy paper ticket, remember to save some time for queuing up at the machine. this experience, in average the train arrived 10 minutes later. It will depart in one minute, how come you are still here? 7. trackwork?If there is trackwork, some tracks will be closed. This make your journey from 5 minutes to 30 minutes. Though they have connected bus, you won't feel good while queuing up for the bus. Usually trackwork will conduct in weekends. Trackwork made us to depart 2 stations before my destination, and followed the direction and get on bus to reach the destination. And I still needed to wait to get on the bus? I have already spent 10+ minutes! Lastly, in total I spent 30 minutes to reach the point, 20 minutes more than taking the train. 8. Some small train stations don't have entrance/exit gate. Sometimes if we adapt to the mode and it becomes a habit. We will think this is rational and in fact we put too much of dependency on it. We don't see its good side and only want to blame whenever there is bad thing happening.If there is delay, fixing, accident, people will start blaming. But what you need to know about the truth is staffs in Hong Kong MTR work 24/7. If they need to ensure the trains work in the day time all 7 days, they can only fix all things in mid-night. They need to finish all checking and fixing before the first train and hope there is no breakdown. When you get on the train in the morning with your eye half opened, have you ever thought that every train has been checked with a full list of requirement to make the train get you to your destination on time?Or whenever you get on the train by just putting your purse on the Octopus Card machine and hear 'doo', have you ever thought about this convenience is a luxury for other places? How long did you not buy a single journey ticket? Or let's think if everyone needs to purchase the ticket at the machine, how long do you need to queue up? Hong Kongese, living in a place of convenience and do not know the fact that they are having convenience that other people cannot enjoy.